This is my last new piece for the OKC Festival of the Arts. I leave day after tomorrow to set up and then will open my booth at 7:30 on Tuesday morning for festival patrons. My husband has been framing and I've been finishing up my drawings and creating new prints of my latest work. I'm so grateful he helps me with all this work. This piece was inspired by the dictionary page. I love the tiny illustration of the bird on the left hand column and there are all sorts of entertaining bird references across the page. This is only the second, giant page I have attempted and the joy is having so much space to draw over. Larger space also means I can give my subjects more detail around the text that is already on the page. I debated about what to have these assorted birds perched on. Not every bird I created lives in the same types of trees of shrubs and I wasn't sure if I wanted to add leaves or evergreen stems. I finally took some of my advice that I share with my students - decide what is important in your piece and don't sweat the supports around it. So I decided to suggest branches around the page with no real attempt to make them complete or precise. 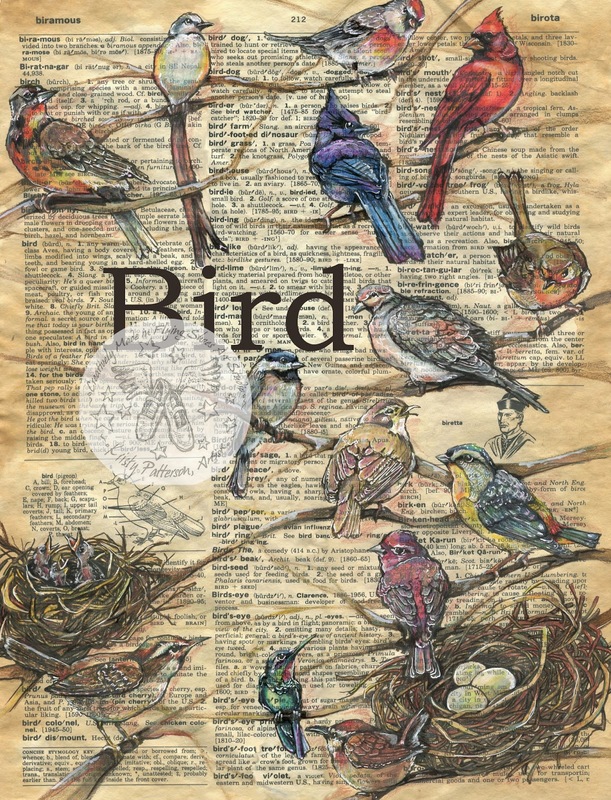 This piece is all about the birds scattered around the definitions. Bird watchers will probably recognize most of the birds I featured. There is a wren, hummingbird, sparrow, chickadee, morning dove, robin, meadowlark, finch, blue jay, cardinal and scissor tail flycatcher (our state bird). Some of the birds are just interesting colors and aren't specific. I also included a nonspecific nest of baby birds and a nest with three little eggs. I always include three eggs to represent my three daughters. Now off to build more prints, load my jeep and close my studio for a few weeks.